I have read enough decor and DIY blogs to know that they are almost always sweet, upbeat, & positive. There are before and after photos of a huge mess, or a plain room, or an ugly lamp, and then…TA DA!! a big reveal where stuff is magically transformed and everyone oohs and aahs! Am I the only one who gets frustrated and annoyed and just plain SICK OF CONSTRUCTIONS AND ALL IT ENTAILS? I have a secret. Come closer,so I can share it with you. I really, really hate painting. I'm tired of construction, and filling nail holes. and sanding. Oh,I love the accomplished feeling I get when it is all done. But truthfully, I can feel very accomplished when I see the end product when I pay some wonderful person to do it! Am I lazy? Maybe a teeny bit. But mostly, I'm not so good at it. I do not have a lot of patience. I wanted to real in this blog, and be truthful. I wanted to show the real journey of making our house into our home. and it’s not all sweetness and light. I don’t find many places on-line where people say-- hey, this stinks. I'm tried of it-- I QUIT! Of course I'm not going to quit- I will follow through and make sure it all gets done. But my real joy isn't in the construction part of it. I love the decorating. Putting it all together - finding unexpected pieces to use to reflect who my family is- how my home lives. I love (and have to!!) do it on a steep budget. It’s a challenge but I'm pretty good at it. (To be honest I do love painting furniture, just not walls.) I love to find something unloved, and making it lovely. This is my lovely view for today. Gloomy, right? I look at 10,000 nail holes that need to be filled, and my eyes tear up. See all those nail holes? messy yup. scaffolding & Cardboard Hated paint cans can’t be put away Yes, that is a saw Notice no curtains. Neighbors have. ok, I do ADORE that buffet, but it needs some love- to be cleaned off, my”magic” to bring it to life. I am going to make another cup of coffee, I am going to count my blessings, and I’m pretty sure they will add up to more than those dreaded nail holes. I’m going to pray for a little bit, pray for some strength, for clearer vision, for patience. Then I’m going to change out of my paint clothes, and go to Wally-world and get some pet food. Then I am going to come home and make Nutella chocolate chip cookies for my kids as I have been promising for days. Maybe I’ll fill holes tonight, maybe i won’t. They will still be there tomorrow. I hope tomorrow I’ll have a totally different attitude. Home projects are exhausting and stressful. I just try to think of how amazing it will look when it is all said and done. Of course I know that this is hard to picture when it is all in shambles. One day at a time, right? Enjoy your cup of coffee and take some time to de-stress. I'm so excited you're here! 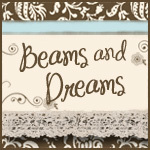 Beams and Dreams is the journey in changing our "builder boring" 1986 Ranch home into the home of our dreams! I'll share my projects with you- successes,failures, tutorials, crafts and home decor tips. Come along with me on this fun, never boring trip!